I use a macbook pro 2015 with macOS High Sierra. I installed windows 10 using bootcamp, which resized the macOS partition and created a 80GB windows partition. The machine boots into windows just fine. Unfortunately I can't go back to macOS because the macOS partition is not selectable as a boot source in bootcamp and "boot into X" boots into windows again. When I start from recovery (ctrl+R) I can see both partitions in diskutil. I tried to repair the macOS partiton but it had no effect. How can i resurrect the macOS partion so I can choose which OS to start? Update: I can start macOS by booting with option/alt pressed and chose the mac partition. thanks a lot for any clarification what is wrong! 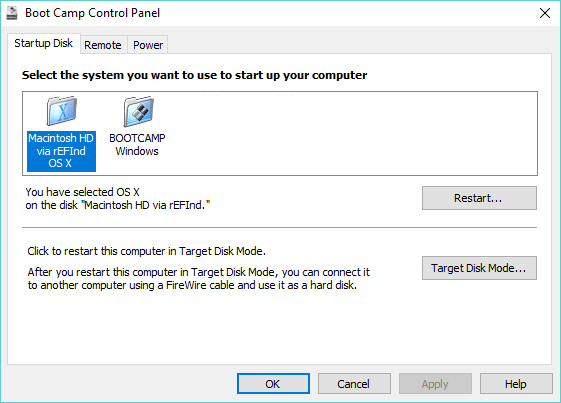 If you use APFS, then your macOS boot volume may not appear as a choice in the Windows Boot Camp Control Panel pane. The following procedure can be used to fix this problem. Since the Windows Boot Camp software can detect bootable "Mac OS Extended (Journaled)" volumes, the follow instructions create such a volume. Instead of placing macOS in the volume, a third party boot manager, called rEFInd, will be substituted. This boot manager will then be configured to silently boot the macOS stored in the APFS container. Finally, macOS will be instructed to not automatically mount this new volume at startup. Below are the steps. The commands need to be entered into a Terminal application window. Create the new volume. The diskutil command, shown below, shrinks the APFS container (170000M, i.e. 170 GB) by 300 MB (169700M) and creates the new 300 MB "Mac OS Extended (Journaled)" volume labeled "Macintosh HD via rEFInd". After the command completes, restart the Mac. Download the rEFInd Boot Manager software from this SourceForge web site. Enter the following commands to install the software to the "Macintosh HD via rEFInd" volume. Note: The error message Could not set boot device property: 0xe00002bc was expected and can be ignored. Configure the TextEdit application. Open TextEdit, then navigate to the "Preferences..." window. Uncheck all the "Options", as shown below. When finished, quit TextEdit. Use the command below to navigate to the folder containing the refind.conf file. cd "/Volumes/Macintosh HD via rEFInd/System/Library/CoreServices"
Make a backup copy of this file. Add write permissions to the CoreServices folder and the refind.conf file. 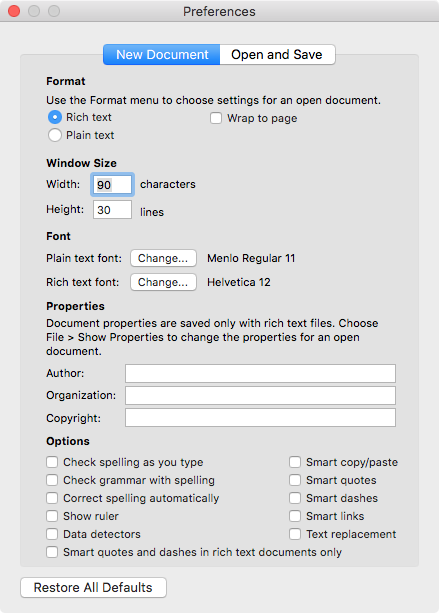 Open the file in the TextEdit application. Add the following lines to the end of the refind.conf file. You should be able to just cut and paste these lines. When finished, save the changes, then quit TextEdit. # Added to make rEFInd silent. Note: If you are using encryption, then see the update to this step shown below. Enter the following commands to modify the /etc/fstab file. This entry will instruct macOS not to mount the volume labeled "Macintosh HD via rEFInd" at startup. Note: The character sequence \040 is just the octal representation of the space character. When finished, restart the Mac. Now when choosing Boot Camp from the Control Panel, you should get something similar to what is shown below. Enter the command given below to get identifier of the booter disk. diskutil info "Macintosh HD" | grep "Booter Disk:"
Your output should be similar to what is shown below. Use the identifier to get the boot disk volume name, as shown below. diskutil info disk1s2 | grep "Volume Name:"
Use the macOS volume name to get the volume UUID, as shown below. diskutil info "Macintosh HD" | grep "Volume UUID:"
Replace the volume with the boot disk volume name and add the volume UUID to the path of the loader, as shown below. Here the assumption has been made that there are no other APFS containers with a bootable macOS installed. If you do have another container, then by boot disk volume names may be the same. In this case, you will need to rename one of of the volumes. To change the volume name in this example from Preboot to Internal Preboot, enter the following commands. First, enter the command shown below to mount the volume. Second, enter the command shown below to rename the volume. diskutil rename disk1s2 "Internal Preboot"
Finally, enter the command shown below to unmount the volume. The lines added to the end of the refind.conf file would then need to appear as shown below. -Once logged in in the flash drive Macos x just go to startup disk and choose your hard disk to reboot into your APFS-based Macos. I hope to have been clear. Not the answer you're looking for? Browse other questions tagged macos bootcamp windows partition apfs . Boot Camp Assistance is stuck on create a partition? Can an APFS volume be moved? Where does the Apple Bootcamp software store the drive definitions on the windows partition? How to remove a container disk and reclaim space with main partition?